(Daniel Newton) A mainstream scientist has blown the whistle on chemtrails being sprayed into the atmosphere. A mainstream scientist who specializes in 'Climate Change' shocked attendees at the annual TED conference in Vancouver, Canada by blowing the whistle on chemtrails being sprayed into the atmosphere by the government. Throughout the controversial Ted Talk, other speakers discussed benefits of geoengineering as a tool to tackle climate change. 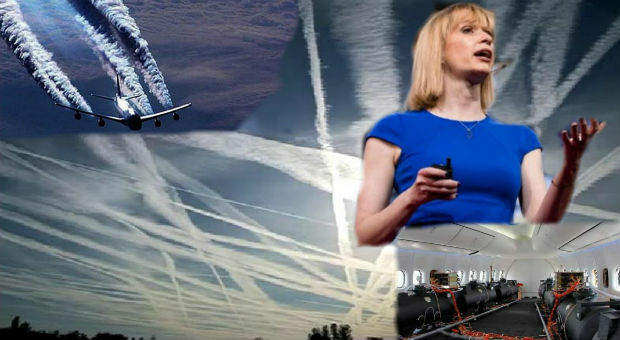 The term ‘geoengineering’ describes this array of technologies that aim, through large-scale and deliberate modifications of the Earth’s energy balance, to reduce temperatures and counteract anthropogenic climate change. Most of these technologies are at the conceptual and research stages, and their effectiveness at reducing global temperatures has yet to be proven. Moreover, very few studies have been published that document the cost, environmental effects, socio-political impacts, and legal implications of geoengineering. If geoengineering technologies were to be deployed, they are expected to have the potential to cause significant transboundary effects. In general, geoengineering technologies are categorized as either a carbon dioxide removal (CDR) method or a solar radiation management (SRM) (or albedo-modification) method. CDR methods address the warming effects of greenhouse gases by removing carbon dioxide (CO2) from the atmosphere. CDR methods include ocean fertilization, and carbon capture and sequestration. SRM methods address climate change by increasing the reflectivity of the Earth’s atmosphere or surface. Hillis told the audience at TED 2017 that in order to “undo the effects of the CO2 we’ve already released” we would have to put chalk in the sky at a rate of 10 teragrams a year. Once Hillis finished singing the praises of geoengineering, climate scientist Kate Marvel was given a chance to respond. Marvel is an associate research scientist at Columbia University, as well as a Science Fellow at Stanford. Marvel also stated that reducing the amount of sunlight is “problematic” and would not do anything about other environmental dangers, such as ocean acidification. Marvel was followed by another call for geoengineering from University of Oxford researcher Tim Kruger. The King of Global Warming Doomsday Prophecies himself, Al Gore, said that geoengineering could be a possible time in the future, but not as the only solution. Marvel is correct that the consequences of geoengineering are not currently known. However, there have been a number of studies which have lead to disastrous possibilities. Most recently, in late October 2016, the United Nations’ Convention on Biological Diversity released a report examining the problems of geoengineering and whether or not humanity will be forced to employ the practice in an attempt to halt climate change. The report, On Climate Geoengineering In relation to the Convention on Biological Diversity: Potential Impacts and Regulatory Framework, found that geoengineering “would reduce the impacts of climate change on biodiversity at the global level,” but also cause unpredictable rain and temperature distribution on the local level. The U.N. concludes that although Solar Radiation Management may possibly slow the loss of Arctic sea ice, but not without “unacceptable climatic impacts elsewhere.” One particular method of SRM involves injecting aerosols into the atmosphere via airplanes. The study found that the use of sulphur aerosols for SRM would be associated with a risk of stratospheric ozone loss. There is also a risk that stratospheric aerosol injection (SAI) would have a small impact on climate change but could lead to negative impacts on biodiversity. The geoengineering TED talks were preceded by a concerning announcement from Harvard related to an upcoming real-world climate engineering experiment. At the recent “Forum on Solar Geoengineering Research,” Harvard engineer (and consistent proponent of climate engineering) David Keith announced his plan for a new project that will assess the risks and benefits of deploying geoengineering on a large public scale. Keith and fellow engineer, Frank Keutsch, will research the benefits and risks by spraying particles such as sulfur dioxide, alumina, or calcium carbonate from a high-altitude balloon over Arizona during 2018. Yet again, the U.S. government is planning to enact a possibly dangerous, untested technology on not only the American population, but the entire world. There are realistic solutions that do not involve edicts from states and statists. If the free hearts and minds of this world – the free humans – recognize the opportunity for a radical change in individual behavior we could erase the unsustainable, destructive industries that damage the planet and all life. If we choose to stand by and not change our own habits and communities, we are giving the state the impetus to act. We are sending the message that the people cannot organize and accomplish goals based on mutual aid. It’s time to stand together in defense of the life on this planet.